Somewhere out there is a human with no attention span who started reading this and gave up on it because they assumed that it would end up being another in a long line of graphic novels about a loser trying to get together with the girl of his dreams in high school. Which would be their loss, as this book has only the barest relationship to those very early pages. This is instead a story of madness, the attempts to deal with it and/or avoid it, and trying to come up with a good definition for mental illness. Jeremy is a kid in high school with few friends, but overall he’s made fun of and has very little luck with the ladies. Well, one lady in particular, who happens to be dating one of his few friends. Jeremy escapes a bit into his dreams and art, but these dreams gradually permeate his waking life until he finally ends up smashing a bunch of glass beakers during his chemistry class. It’s always best if you have your freak-out in high school behind closed doors, but Jeremy does not have that luxury, and he ends up getting sent to a facility where they try to get him back to normal. 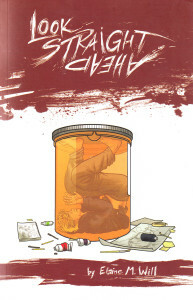 This is where I get into tricky territory in regards to potential spoilers, so I’ll just say that the rest of the graphic novel deals with his conversations with his demons (literally), the ups and downs of trying to regulate his moods and, above all, the world from his perspective. This is where the book really shines, as we’re immersed in his world and his view of what’s happening to him, along with his own internal logic about his conversations with God and his destiny. He also has to complete this destiny before he dies, because “they” have given him cancer and bugs crawling on his brain. It’s some genuinely terrifying and unnerving stuff, and the arc of it is beautifully done. This is damned near required reading for anybody who has had a friend/relative/acquaintance suffer through mental illness, as you see exactly what Jeremy was going through every step of the way. 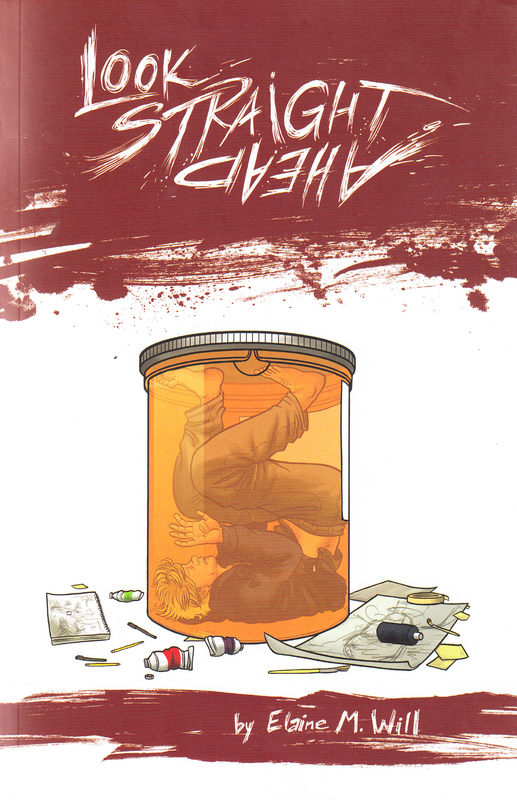 For a first graphic novel it’s damned near perfect, and I’m intrigued to see what else Elaine comes up with. This was published with help from the Xeric Grant, which is now gone, so I’m curious/nervous to see what replaces it. What, aren’t there any rich and famous people who want to help out with this sort of thing? Didn’t I see a quote from Jenna Fischer (from The Office) on an old Renee French graphic novel? Somebody who knows her should see if she wants to help out with a grant like this, as she definitely has a pile of money from that show. But I’ve wandered very far from the subject. Check out this book, that’s what I was getting at before I derailed myself. It should not be missed. Posted on July 29, 2013, in Reviews and tagged Elaine M. Will, Look Straight Ahead. Bookmark the permalink. Comments Off on Will, Elaine M. – Look Straight Ahead.